* yo, insert in stitch and pull up loop, * rpt from * to * once, yo, pull through 4 loops, yo, pull through 2 loops. 2nd Row – ch3, * 3ps in centre ps of 3ps group, 1dc in dc, * rpt from * to * to end, working last dc in top of ch3. Turn. Rpt last row until 10ps group rows have been worked in all from yoke or work measures approx 11 Inches from shoulder. Fasten off. Pattern Row – ch3, 3ps in centre ps on 3ps group, * 1dc in next dc, 3ps in centre ps of 3ps group, * rpt from * to * to end, sl st in top of ch3. Turn. Rpt Pattern Row until 8ps group rows have been worked or work measures approx 4.5 Inches. Turn. Work 2 more rows in sc, turning at the end of each row and sl st to first sc. Fasten off. Button/Buttonhole Bands – Written for a boy, swap buttonholes to opposite side for a girl. With WS facing rejoin yarn to bottom edge on left front so you are working up towards neck edge, work 40sc evenly along, 3sc in corner, 1sc in each st around neck, 3sc in corner, work 39sc evenly down second side of front edge, 3sc in corner, 1sc in each st along bottom of jacket, 1sc in corner, sl st to first sc on beginning of row. Turn. Next Row – ch1, 1sc in base of ch1, 1sc in each sc and ch2 space to neck edge. Fasten off. Button Band – With WS facing starting on neck edge, work 1sc in each sc to corner. Fasten off. 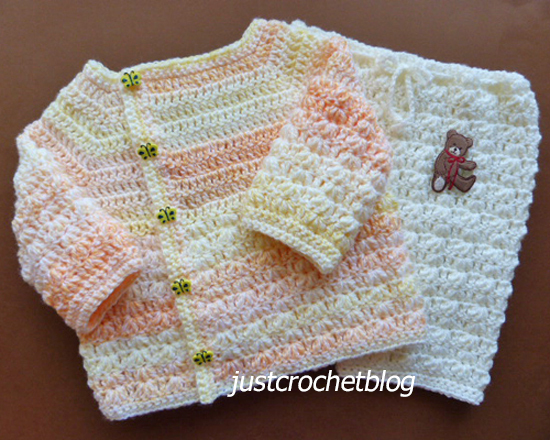 Finishing – Close small gaps underarms, weave in and trim off any loose ends of yarn. Sew on buttons to correspond with buttonholes. Rows 3 to 11 – ch3, 3ps in centre ps on 3ps group, * 1dc in next dc, 3ps in centre ps of 3ps group, * rpt from * to * to end, sl st in top of ch3. Turn. Rpt Pattern Row from sleeves until 10ps group rows have been work from division or work measures approx 10.5 Inches from waist. Second Leg – Return to un-worked stitches at division, join yarn with as sl st to same dc as last dc worked on first leg, ch3, continue in the same way as first leg. Fasten off. Chain Tie – ch150. Fasten off. Finishing – Close small gap on crotch, weave in all loose ends of yarn and trim off, thread chain tie through alternate stitches on waist and tie with a bow. 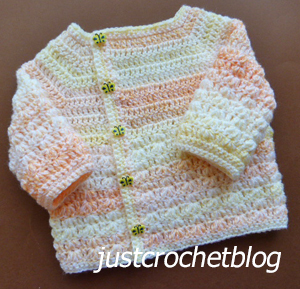 Hope you enjoy this free crochet wrapped jacket-pants pattern, don’t forget to pin!